All IT Pros hear “Help, my computer is not working,” on a regular basis. In most cases, the user could solve their own issues by following a few simple steps. 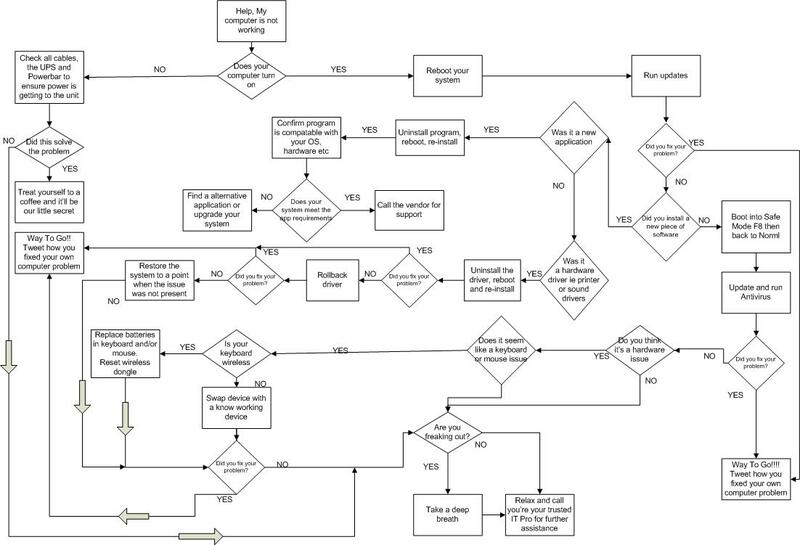 Before calling your IT Pro, try the following steps in the flowchart below. In the best case scenario, you fix your own issue, gain some IT know how, and save a few bucks. Worst case scenario: you still have to call your IT Pro, but at least you have made the attempt. If you still need to call in an IT Pro, it’s nice to provide a list of items you have already tried, when the issue started and if anything has changed. The more information you can provide to your IT Pro, the less time they will need to spend troubleshooting. In all cases ensure you have a backup of your data, just in case.